The origins of Crowland Abbey date back to the year 699, when St. Guthlac chose the island of Crowland, in the Fens, as the site for his hermitage. In 716, two years after his death, a church was founded on the site. It was burned down by Vikings in 870; rebuilt; burned down again in 1091; rebuilt; destroyed by an earthquake in 1118; rebuilt; and burned down again in 1143. It fared better in the 13th century, when this manuscript was made. 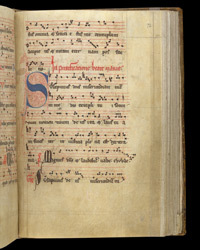 This initial 'S' marks the start of the music for the feast of the Purification of the Virgin Mary, also known as Candlemas Day, on 2 February (the 40th day after Christmas day).